Many firms seek to get a maximum profit in the marketplace but how can they succeed their goal. Economics is the study to understand marketplaces and how people make their choices consumers (Begg and Ward, 2012).Economics is everywhere, affecting every business whether large or small. In order to make a profit, firms have to take a risk and make a decision under different situation. Understanding economics will help business owner making the right decision. (Dransfield, 2014). Mobile telecommunication plays an important role for both business and economy. In the business, it has been used to transfer voice or data over long distance, allowing people to interact with each other, many firms take an advantage of this modern technology to make communication to their supplier, customers and manage daily work. There are nearly 7 billion mobile subscriptions worldwide, this is equivalent to 95.5 per cent of the world population and this trend is predicted to increase rapidly in the future (ITU, 2014). The main studies of this paper aim to understand economics for telecommunication industry in Thailand and the major factors that affect the competitive structure. This paper is organized by giving a general idea about Thai mobile communication background and the economic situation in the market, then moving into market structure, analysing competition within an industry and price competition strategies in the telecommunication market which is spitted into two parts: price competition and non-price competition. Conclusions are also drawn in a summary section. In a year after that, Joint venture company between Hong Kong-based Hutchison and CAT, named Hutch CAT wireless Multimedia (Hutch), entered to the market by using CDMA technology. It provides the service covered Bangkok area and mainly 25 central provinces. Thai Mobile was the last mobile operator introduced to the market in 2004. It was a joint venture company between CAT and TOT. In 2008, The company was terminated by the agreement between TOT and CAT and all assets were transferred to TOT. It is now renamed to be TOT3G and solely owned by TOT. However, more than 97% of mobile subscribers belong to the three major mobile operators Advanced Info Service (AIS), Total Access Communication (DTAC), and True Move. In late 2004, The National Telecommunications Commission (NTC) was established to takeover regulatory roles from TOT and CAT. The NTC set up the essential regulations, such as interconnection regulation, a licensing regime, market definition, Significant Market Power (SMP) regulation etc. The mobile number portability (MNP) is a first priority of NTC and they planned to implement within one year. Nevertheless, the implementation of MNP was delayed until in December 2010. The MNP clearing house has a 400 mobile numbers per operator per day capacity with three days porting duration. The NTC had planned to issue new 3G licences but The Supreme Administrative Court decreed that the NTC did not have authority to issue the 3G license. 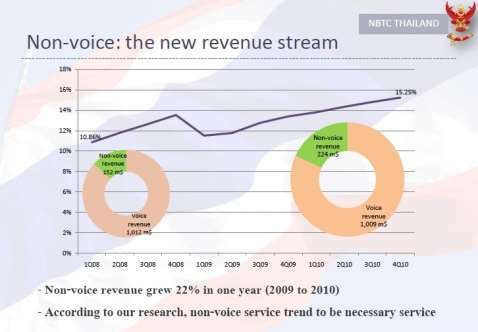 Due to the 2007 constitution in Thailand, The National Broadcasting and Telecommunications Commission (NBTC) needs to be formed to oversee the situation (S. Chalita and S. Pratompong et al (2013). Therefore NTC was transformed to be NBTC since then. In October 2012 after the auction, NBTC agreed to issue 3G licenses for a total of 41.63 billion baht ($1.36 billion) to three mobile service providers. Advanced Info Service PCL (ADVANC.TH), Thailand leading mobile services provider, paid THB14.63 billion for 15 MHz of bandwidth. The second mobile service provider, Total Access Communication PCL (DTAC.TH), and the third mobile service provider, TrueMove PCL, each paid THB13.50 billion for the same bandwidth as AIS (W. Payungsak and P. Phisanu, 2013). Thailand mobile communication market falls under oligopoly characteristics. 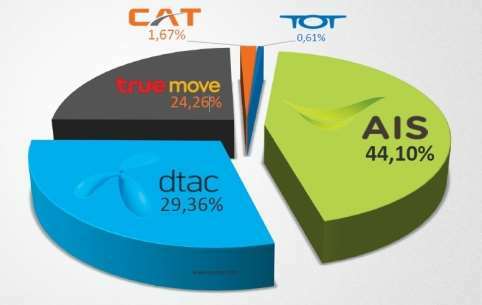 1) The market is dominated by the three main firms: AIS, DTAC and True Move, which have more than 97% of the market (Figure 1). There are also two the state-owned companies: Telephone Organization of Thailand (TOT) and Communications Authority of Thailand (CAT) which have only small portion in the market 0.61% and 1.67% respectively (yozzo.com, 2014). 2) The barriers to entry and exit are high in telecommunication industry. In the short run, the average cost would be enormous because all the firms have to invest a lot of money to build up telecommunication infrastructure. 3) The basic products offered in telecommunication are very similar. The power of suppliers is the power that firms have on the price of the product. The power of suppliers in Thailand telecommunication is medium because the switching cost is zero. Many customers will change the product, if they feel that the price the firm charging is very high compared to the other operators. Even there are just a few they can choose, as of oligopoly, but at least there are choices. The power of buyers is the power that consumers have on a product price. If buyers have a strong power, they can influence the product price. The switching cost of telecommunication in Thailand is zero. Customers can switch from one operator to the others very easy without paying any fees but because of quality of service and branding, many customers are likely to change. It is even easier especially when the MNP was implemented because subscribers can carry the same number when transferring to new operator. Substitute products are the product that can satisfy customers need the same way as another product. Today, many new innovation technologies are invented and can be used to replace traditional mobile services such as international telephone service, the voice over internet (VoIP) which can reduce the cost of the consumers when calling the international destination or the free over the top (OTT) service like Skype, Whatapp, Line, etc. can also be alternative. They are the major threats of mobile communication service for international call or even the local call. As shows in the figure 2, The trend is beginning to changed, consumers are using text message (non-voice) more to communication to each other than telephone call (voice) that make the revenue of non-voice call increasing. In mobile communication, threat of new entrants is very low because of Entry and exit barriers are very high in this industry. There are many barriers to enter the market in Thailand. The first one is the license fee and regulation. The second is high of infrastructure cost. In 2012, NTBC was auctioning 3G spectrum of 45 megahertz (MHz) of bandwidth and There is only nine blocks were available, each bidder will be allowed to get only 15 MHz or three blocks which the minimum fee. There are only three largest mobile operators submitted bit. The Competitive Rivalry is high in Thailand as a price war can be seen from time to time and there are new promotions to attract subscribers. Particularly after 3G implementation, DTAC the second largest operator tends to lose its position. So it is now struggling and trying to maintain the position by improving its service quality, creating new image by advertising and release new promotional marketing as well as attractive campaigns. The competition could be even higher when 4G era is coming and the auction for the license is going to happen next year or so. ‘The measurement of changes in quantity demanded in relation to changes in price is called price elasticity. Simple, firms need to estimate how responsive consumers will be with respect to fluctuations in pricing. Elasticity is calculated by dividing the percentage change in quantity taken by the percentage change in price. In defining elasticities at various pricing points, a firm is able to compute gross revenues in relation to the number of units sold. 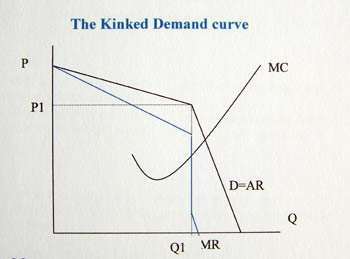 Thus, analysis of elasticity serves two goals: (1) to gain a keener sense of the sensitivity of consumers to current and prospective changes in price and (2) to facilitate foresting revenue in the face of competitive pressures in pricing’ (james k. shaw, 2001). The Figure X shows the relationship between price changes, demand elasticity, and total revenues. 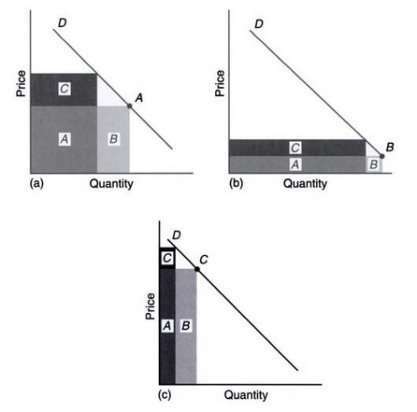 The depicts define that as price increase the revenue expands by rectangle C and decrease by rectangle B, under conditions of (a) unit elastic, price change equals to quantity change (b) inelastic, price change will cause small change in quantity and (c) elastic market environment (james k. shaw, 2001). Pricing competitioncan influence the whole industry, clearly when setting price the firm has to look at the price of the competitors. Many competitors set their price according to their rivals in the market. In oligopolistic industry, there are a few dominant firms in the market, the leading firms in the market are in the position of setting price. They are often the first one in the industry to change price. Smaller firms must react immediately once the big companies lower their price to retain their market share. Competitive pricing is used more often by firms which providing the homogeneous products. For mobile communication in Thailand, there are two different price competitions depending on the market strategy of individual firms. The first one is price war, firm will reduce their cost to gain more market share and compete with their competitors. The second is price discrimination where the firm will charges a different price to different groups of customers. The price war is a strategy used in the industry that selling the homogeneous products. If prices decrease, the sales quantity will increase, the customers will receive the benefits from this (BAIN , 1952). In Thailand, mobile communication competition is very aggressive in terms of pricing, retailed prices in mobile communication are usually separated in two parts: prepaid and postpaid. In the mobile communication industry, there is no subscription fee for receiving calls for prepaid but to make call it requires subscriber to purchase call credit. For postpaid, there is a charge monthly or depend on the contract between the provider and subscriber for the ability to make and receive calls (Chalita and Pratompong el at, 2010). In Thailand, the prepaid customers have an enormous proportion in the industry which is more than 80% of the total market (Figure X). In Oct 2006, AIS, Thailand’s biggest mobile operator, started an aggressive pre-paid price war promotional package by offering a new subscriber calls for a flat rate of THB 1 (USD0.026) to different network between midnight and 2pm and THB 1 per minute to any network at all other times, aiming to attract up to 800,000 new subscribers. DTAC, the second large operator, responded to AIS latest announced by lunch an even lower rate promotion in the next few months. True Move also followed suit M. Usanee (2006). There is often a price war between the operators in Thailand because every operator wants to have the biggest share in the market and sometimes to test the ability of their competitors in the market. Price discrimination is a price strategy that the firm charge different groups of consumers for the homogeneous good or service differently. The firm is able to charge a lower price to the consumers with a more elastic demand and the higher price to the consumer with a more price inelastic demand. In Thailand mobile communication, every mobile service provider offers different tariff to different group of people. There are many tariff plans in telecommunication market in Thailand but the main tariff plans focusing on three groups of people. First tariff plan is the highest charge, it focuses on the customers who are willing to pay more in exchange to get unlimited usage. This group of customers is usually a business customer or corporate. The second plan is the medium charge for general customers who have general requirements for using mobile phone or mobile device to communicate with their friends or surfing Internet on their mobile phone. The third tariff plan is the lowest plan the customers will pay as lowest as possible to keep their mobile phone working, they do not often use mobile phone for calling but just for receiving a call. Non-price competition is one of the market strategies in oligopoly. In mobile communication normally focuses on the competition over the quantity of sales, branding, product differentiation and aggressive advertising. Firms will participate in non-price competition because of fear of price war which will increase their revenue (Boundless, 2014). There are many non-price competition techniques but in this paper will focus on quality of service and product differentiation which can help operators increasing their revenue and avoiding the price war. One of the factors that subscribers choose mobile telecommunication network is its coverage. Consumer can make a call only if there is a cell covering in the area that the user is travelling to. When the traffic increases within an area, the service providers have to expand the capacity to cover the usage. If consumers have to choose between two mobile communication service providers which offer the same price, they generally choose the one who has higher quality (G. Harald (2005). According to Communications consumer panel search (2009), it shows that mobile coverage is very critical to small business among cost, quality of customer service and business packages. It is the most important consideration for small business to choose a mobile service provider. AIS, the biggest mobile communication service providers, have its coverage more than 97% of population for 2G and 80% for 3G network (yozzo.com (2014). Product differentiation is the degree to which an industry’s product differs from one producers to another. In principle, products and services that provider untilitarianutilitarian value tend to be un differentiated (Richard A. Gershon, 2009). In mobile communication industry, each firm’s demand curve depends on how competitors react. Firms must depict what their rivals will behave (B. David and V. Gianluigi et al (2008). "Telecommunication Industry Economics Analysis." UKEssays.com. 11 2018. All Answers Ltd. 04 2019 <https://www.ukessays.com/essays/economics/telecommunication-industry-economics-6417.php?vref=1>. "Telecommunication Industry Economics Analysis." All Answers Ltd. ukessays.com, November 2018. Web. 22 April 2019. <https://www.ukessays.com/essays/economics/telecommunication-industry-economics-6417.php?vref=1>. UKEssays. November 2018. Telecommunication Industry Economics Analysis. [online]. Available from: https://www.ukessays.com/essays/economics/telecommunication-industry-economics-6417.php?vref=1 [Accessed 22 April 2019]. UKEssays. Telecommunication Industry Economics Analysis [Internet]. November 2018. [Accessed 22 April 2019]; Available from: https://www.ukessays.com/essays/economics/telecommunication-industry-economics-6417.php?vref=1.